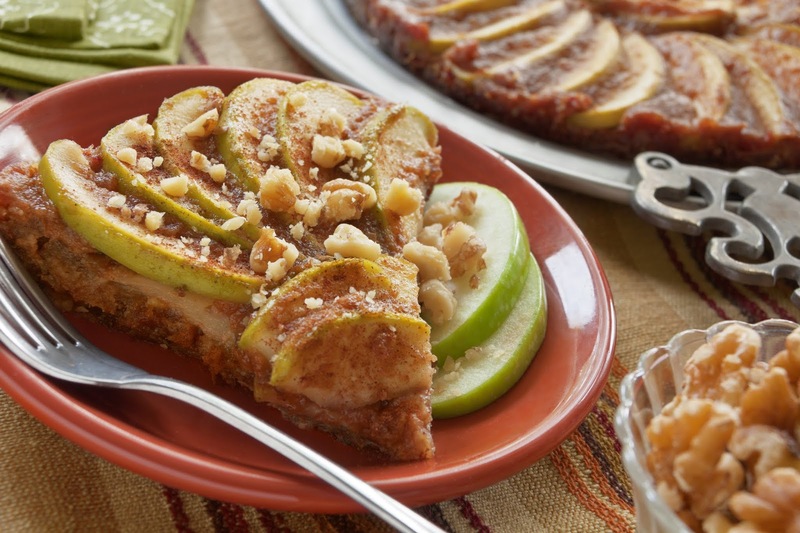 Here are some recipes for Guiding Stars for Pi Day (3/14). Since 2006, Guiding Stars has been making nutrition as easy as 1, 2, 3. They analyze foods using a patented algorithm and translate the nutrition information to a rating system that is easy to understand. 1. Preheat oven to 375ºF. Spray a pie pan with non-stick cooking spray. 3. In a separate bowl, whip together wet ingredients. 4. Mix wet ingredients into dry. Pour mixture into pie pan. 5. Arrange strawberries on top of the oat mixture. Sprinkle with coconut. 6. Bake for 35 minutes until middle is set and edges begin to brown. 2. Melt butter over medium heat in a large, heavy-bottomed pan. When it foams, add fennel, onions, and carrots. Cook until just soft (2 minutes). Stir in mushrooms and potato. Cook until mushrooms have let off water and have shrunk (6 minutes). 3. Sprinkle flour over vegetables, stir to coat, and cook until raw flavor is gone (1-2 minutes). Stir in broth and milk until mixture is smooth. Bring to a simmer over medium heat, stirring constantly, and cook until slightly thickened (5 minutes). 4. Remove from heat. Stir in peas, herbs, and vinegar. Pour filling into a deep-dish pie pan. 5. Whisk egg together with water. Set aside. 6. Place dough over filling, tuck into the edges of the dish, and remove excess. Brush dough with egg wash and cut slits in the top to vent. Place on a baking sheet and bake until crust is golden brown and mixture is bubbling (25-30 minutes). Let sit to allow sauce to thicken before serving (10-15 minutes). 1. In a large bowl, combine 1/4 cup of the egg substitute, onion, and Parmesan cheese. Stir in potatoes. Transfer mixture to an oiled 9 inch pie plate; pat mixture into eh bottom and up the sides. 2. Bake, uncovered in a 400 degree Fahrenheit oven for 35 to 40 minutes or until golden brown. Cool slightly on a wire rack. reduce oven temperature to 350 degrees Fahrenheit. 3. In a large skillet cook zucchini and garlic in hot oil until zucchini is crisp-tender; cool slightly. Place cheese slices in bottom of the potato crust, tearing to fit. Arrange zucchini mixture over cheese. 4. In a small bowl combine the remaining 3/4 cup egg substitute, milk, oregano, pepper and salt. Pour over the zucchini mixture in crust. 5. Bake in the 350 degree oven for 25 to 30 minutes or until filling appears set when gently shaken. Let stand for 10 minutes before serving. 1. Preheat oven to 350ºF. Line an 8″ tart pan with parchment paper. 2. Cover 18 dates with half of the warm water and set aside. 3. Place walnuts in food processor and grind to a fine meal. Add the remaining pitted dates and water and process until dates are blended with the walnuts to form a coarse, sticky meal. Press mixture into tart pan. 4. Place soaking dates and their liquid in blender along with cinnamon, nutmeg, vanilla and salt. Blend until smooth. 5. In a medium bowl, toss apple slices with the date sauce. Layer into crust. 6. Bake for 30-45 minutes, or until apples are tender when poked with a fork. Sprinkle with extra cinnamon to serve. 1. Puree the raisins to a smooth paste in a blender. 2. Add spices and pumpkin, puree until smooth. 3. 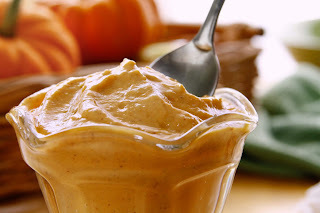 Fold pumpkin mix into yogurt until well combined. 2. Coat a 10-inch round and 2-inch deep casserole with cooking spray, Set aside. 3. 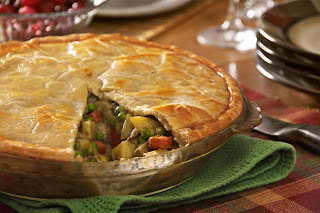 To make crust: In a large saucepan, bring chicken broth to a boil over medium-high heat. Gradually stir in cornmeal, cumin, salt, and cayenne. Reduce heat to medium and cook, stirring constantly, until thickened, 10 to 12 minutes. Immediately spread mixture to a depth of about 1/2 inch over bottom and sides of prepared casserole. Set aside. 4. To make filling: Lightly coat a large nonstick skillet with cooking spray. Place over medium-high heat. Add chicken and sauté until brown on all sides, about 5 minutes. Add corn, onion, tomato, tomatillos, jalapenos, garlic, rains with their liquid, chili powder, cumin, oregano, and cheese. Stir until will blended. 1. Mash the avocado with a fork or food processor until smooth. 2. Stir in lime juice, zest, stevia, vanilla and salt until combined. 3. Cover with plastic wrap and chill for about an hour. 4. 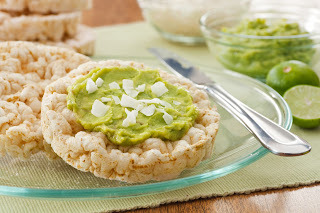 Spread on rice cakes and sprinkle on coconut.